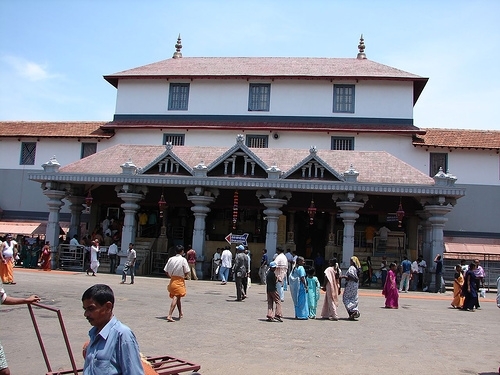 All the Temple Tours Mangalore starts from Mangalore Railway Station. Prices given below are in INR including taxes and driver allowances. This holy place is the home of the Sri Manjunatheshwara Temple, where devotees of all castes and creeds visit. The temple is devoted to Shiva and houses a linga of gold. The temple is unusual in that it is run by a Jain administration and poojas are conducted by Madhva priests. Everyone enjoys the generous hospitality without any distinction of caste, creed or class whatsoever. On an average the flow of pilgrims is about 10,000 people a day. A mechanised and clean kitchen provides free food for all pilgrims. There are guest houses with modern amenities.The temple is unique example of unity in diversity. It has been told in Dharmasthala that the Shiva Linga in Dharmasthala was brought to Dharmasthala by a man named Annappa. Legend is that he used to work for the Heggade family. Once when the Heggade he was serving wanted to worship Lord Shiva, Annappa had assured him to get one linga and vanished from the sight. Surprisingly next day morning, by the time all woke up, he had already established the linga in Dharmasthala, a few metres away from Heggade’s house. Later it was known that the Linga was from Kadri near Mangalore, from the Kadri temple. By then, Annappa had vanished and he was never again sighted in the vicinity. Now people in Dharmasthala worship Annappa as Annappa Panjurli, a local god deva and a hero. In 1973 a statue of Lord Bahubali carved out of a single rock, was installed at Dharmasthala on a low hill near the Manjunatha temple. It is about 39 foot (12 m) high and weighed about 175 tonnes. Kukke Subramanya is one of the most wonderful and devotional places in the state of Karnataka. Lord Subramanya is the principal deity worshiped in this temple in the form of a Cobra. This temple is located on the bank of the river Dhara which according to the mythology relates to a sacred event of the past days. According to this mythology, Lord Kumaraswamy after killing the ruler Tarakasura and Shoorapadmasura in a battle came down to this place. When the war with the demons was over, Lord Kumaraswamy went to the top of Kumara Parvatha together with his brothers Lord Ganesha, Veerabahu and others. He washed his Shakti Ayudha (Weapon) which is a battle- axe in the water of the Dhara river that flows from the Kumara mountain. From this incidence the river came to be recognized as Kumaradhara. They were greeted by Lord Indra as well as the other Gods. Lord Indra was so moved by his bravery that he prayed the Lord to marry his daughter Devasena. The marriage took place on the banks of Kumaradhara on ‘Margashira Shudda Shashti’ with much grandeur and celebrations and even today each year a popular car festival is held in the Kukke Subramanya of Karnataka on ‘Margashira Shuddha Shashti’ with special offerings to the Lord. Lord Kumaraswamy gave visit to Vasuki the chief of the nagas or the snakes, who had been undergoing a penance in the Kukke Subramanya. Vasuki prayed to the Lord to remain with him forever at this place. The Lord accepted and granted this boon. Till then it is said that the Lord has remained in his spiritual presence in this shrine along with his wife Devasena and Vasuki. The Kukke Subramanya Temple is situated in Sullia taluk amidst forest ranges of wester ghats in Sullia taluk, and is about 105 kms. far from Mangalore city and about 380 kms from Bangalore. In earlier days Subramanya used to be recognized as Kukke Pattana. 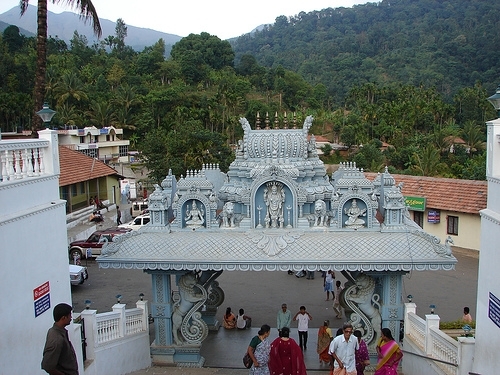 The main entrance of the Kukke Subramanya Temple of Karnataka lies towards the east. The worshipers enter into the temple from the back side of it and then go before the shrine to see the face of the mighty God. 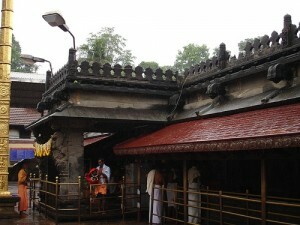 The Kukke Subramanya Temple has a sanctuary which is located at the opposite side of the main entrance. There is a pillar in the Kukke Subramanya Temple. It is believed that this pillar was erected in order to save the people from the flame of the breath of the dangerous Basukinag who was residing inside. There is a dais in the sanctuary of Sri Subramanya which is the residence of the idols of Vasuki and Maha Shesha. Sarpa Samskara/Sarpa Dosha is one of the poojas performed at this temple by devotees to get rid of the sarpa dosha. 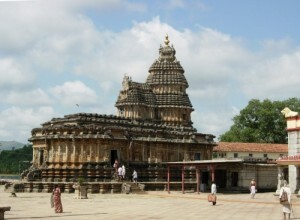 Sringeri is the first of the four pithas established by Bhagavan Sri Sankaracharya. Sringeri is the modern rendering of Sringa Giri or the Mountain of Rishyasringa, a great rishi whose tomb is still preserved, and thousands of pilgrims brave the hard path and repair there worship at the holy shrine. Situated in the Western Ghats on the banks of the Tungabhadra, Sringeri is the seat of spirituality established by Adi Shankara in the Eighth century. Sringeri was discovered by Sri Sankaracharya as a place where even natural animosities did not exist, as he saw a frog in labor protected from the scorching rays of the sun by a raised hood of a cobra. He installed at that place the Goddess of learning, Sri Sharada. He also established a Matha for the propagation of Advaita philosophy, and his first sishya Sri Suresvaracharya was made the head of the Matha. From then onwards, Sringeri has become famous as a center of learning, philosophy and sublime spirituality. It is one of the holy places of India and it attracts many pilgrims. The reigning deity Sharadamba, consort of Lord Brahma, epitomises supreme knowledge. She is seated on top of the Sri Chakra consecrated by Adi Shankara who established four maths to carry forth his teachings — Sringeri in the south, Puri in the east, Dwarka in the west and Joshir Math Badri in the north. Many festivals are celebrated with pomp here but the Sharannavarathiri is an important one. Marking the victory of the goddess Mahakali over Mahishasura, the festival occurs in September-October. The goddess emerged victorious in her fight on the 10th day, which signifies the victory of righteousness. This festival has been celebrated from the time of sage Vidyaranya in the 14th Century. On Amavasya, the goddess is decked out as Jagat Prasutika or the Universal Mother. During the next nine days, she is decorated and placed on a different vahana (vehicle) showing her in various forms – Brahmi on the swan, Maheshwari on the bull, Mayuri on the peacock, Vaishnavi on Garuda, Indrani on the elephant, Chamundi on the lion, Aswavahini on the horse and as Mohini and Rajarajeshwari. Adi Shankara was born in Kalady on Vaisakha Panchami under the asterix of Thiruvadirai to the Namboodri brahmin couple, Sivaguru and Aryambal. Shankara lost his father at a young age. He was a brilliant student of scriptures and aspiration for a spiritual life seemed to come to him naturally. Legend has it that once when he was attacked by a crocodile while bathing in the Periyar (Poorna) river, Aryambal gave him permission to take sanyas, as that was the only way to escape the jaws of the crocodile. Shankara on his wanderings but assured his mother that he would be with her during her last days. History tells us that he heard her call when he was journeying in the North and immediately came to Kalady. As desired by her, he prayed to Lord Vishnu who made his presence felt by giving darshan as Krishna to the dying lady. An ancient Krishna temple stands at that spot to this day. Apparently, the local Namboodiri brahmins refused to take part in Aryambal’s funeral if Shankara, a sanyasi, were light the pyre. They would not give him fire for igniting the pile. It is believed that Shankara produced fire from his palm for the cremation. An ancient deepa-sthambha stands a mute witness to this drama enacted 1200 years ago. After taking sanyas, and bidding farewell to Aryambal, Shankara reached the banks of the Narmada, and prostrated before Govindapada who accepted him as his disciple. Govindapada was himself the disciple of Gowdapada, spoken of as an incarnation of Adi Sesha. Mastery over the scriptures came within a short time, and Shankara left on his holy wanderings. He is said to have travelled all over India thrice and won several philosophical contests. A large group of disciples began to gather around him. The most well known were Sureshwaracharya, Padmapada, Hastamalaka and Totakacharya. Adi Shankara’s life is entwined with miracles, but his compassion for the `other’ person comes through in his writings as well as in the narratives about his life. He was known for his keen debating skills and the debate he had with Mandana Mishra, and Mandana’s wife Ubhaya Bharati is famous. The four Mutts founded by Adi Shankara have been instruments of integrating India. In the North, he founded the Jyotir Mutt at Badrikashram where the Alaknanda flows and installed Narayana and Poornagiri Shakti as the presiding deities. Totakacharya was made in charge of the institution. In the East, he established the Govardhan Mutt at Puri on the Bay of Bengal with Purushottama and Vrishala Vimala Shakti. Hastamalaka took charge as the first Pontiff. In the West, we have the Kali Mutt at Dwaraka presided over by Siddheshwar and Bhadrakali Shakti. Padmapada became the first Shankaracharya for the Mutt. A wonderful legend marks the founding of the Sringeri Mutt in the South. Adi Shankara was traversing the hilly regions on the banks of the Tunga in Karnataka. The mid-day sun was scorching from above and a cobra was spreading its hood as a cover for a female frog that was in labour. The great teacher had a vision of the true instrument that binds all creation, an Advaitic whole. Immediately, he set to work and founded the Sringeri Mutt by sculpting the Sri Chakra on a rock and installing Mother Sarada on it. As promised earlier, Ubhaya Bharati came to reside here as a presence of Brahmavidya. Adi Shankara gave Sureshwara the charge of the Mutt and also the spatika lingam of Chandramowliswara and the image of Ratnagarbha Ganapati (crystal embedded with a ruby). For 12 years, he stayed here. The great teacher passed away in 820 A.D. at Kedarnath on the Himalayas but the news reached Kerala only five years later. King Udaya Marthanda Varma of Kollam who heard of this in 825 immediately declared it as the beginning of the Kollam Era. Shankaracharya’s fame spread far and wide, biographies were written and the institutions founded by him prospered. However, the public almost totally forgot the place where he was born, the tiny village of Kalady on the Periyar. It was the 33rd pontiff of the Sringeri Mutt who rediscovered Kalady. Sri Sacchindananda Sivabhinava Nrisimha Bharati was born in 1858 as Sivaswami in Mysore. Orphaned at an early age, he was taken in by the 32nd Pontiff, Sri Ugra Nrisimha Bharati who gave him sanyasa at the age of eight. Nurtured by his guru, Sri Nrisimha Bharati mastered the scriptures and the administrative intricacies and ritualism associated with the Mutt’s far-flung branches and Mother Sarada at Sringeri. He was engaged in meditation upon the personality of Adi Shankara and wished to consecrate his birthplace. He created an interest in the subject by instituting an annual five-day Shankara Jayanti. A fortuitous occurrence helped the search when Seshadri Iyer of Kerala became the Dewan of Mysore. Drawing the needed directions from Vidyaranya’s Shankara Vijaya, the Swami asked Seshadri Iyer to undertake the task of finding out the birthplace of Adi Shankara. Iyer immediately began enquiries and identified Kalady in Kuttanad taluk. Then there was speedy progress. The cremation site of Aryambal was discovered too. The Maharajahs of Mysore and Travancore as also leaders of the community came forward with the necessary help and monetary aid to Sringeri Mutt for taking over the area and building a temple. Temples for Sapthamatrukas including Brahmi (Sarada) and Adi Shankara were constructed and were consecrated on 21 February, 1910. Horanadu is a holy place located in Chickmagalur district. The main deity at the Annapoorneshwari Temple at Horanadu is Goddess Annapurneshwari. The idol of goddess Annapurneshwari was established in 1973 in the temple. The main deity of Annapoorna is made of gold it is said that a person who seeks the goddess blessings would never have any scarcity for food in life. It is believed that lord Shiva once had a curse and that this curse was reversed when the lord visited Goddess Annapoorna and sought her blessings. The route to the temple traverses ghats, amazingly dense forests and vegetation. It feels like the most beautiful route one can ever take, with nature in all Her resplendent glory. The Mookambika Devi Temple of Kollur, dedicated to Mookambika Devi, is one of the most prominent shrines for people in the state of Karnataka and Kerala. It is at a distance of 147 km from Mangalore in the serene green surroundings presented by the banks of the river Sauparnika and the majestic Kodachadri hills, the temple attracts millions of pilgrims every year. The temple holds immense relevance for the devotees as it is associated with revered Hindu saint and Vedic scholar Adi Shankara. It is believed that Adi Shankara perceived the idea of having a Mookambika Devi temple at Kollur and himself installed the idol of deity in the temple some 1200 years ago. People have high faith in Mookambika Devi Temple as Goddess Mookambika is regarded as a manifestation of Shakti, Saraswathi and Mahalakshmi. In fact Temple of Mookambika Devi is one of the ‘Seven Muktistala’ pilgrimage sites in Karnataka which are Kollur, Udupi, Subrahmanya, Kumbasi, Kodeshwara, Sankaranarayana and Gokarna. The Mookambika Devi Temple stands on a spur of the Kodachadri peak. The deity is in the form of Jyotir-Linga incorporating both Shiva and Shakti. The Panchaloha image (five element mixed metal) of the Goddess on Shree Chakra is stated to have been consecrated by Adi Shankaracharya during his visit to this place. There is an exquisite sculpture of Panchamukha Ganesha here. Kollur is regarded as one of the Seven Muktistala pilgrimage sites, of Parashurama Kshetra, in Karnataka which are (Kollur), Udupi, Subrahmanya, Kumbasi, Kodeshwara, Sankaranarayana and Gokarna. According to the legends, Kola Maharshi who was doing penance here, was disturbed by a demon who was also engaged in doing penance to please Lord Shiva, to get a boon from Him. To prevent the demon from fulfilling his evil desire, Adi Shakti made him dumb (mooka) and when the Lord appeared before him, he could not ask for anything. Thereupon he got enraged and soon began troubling Kola Maharshi who prayed to Adi Shakti for deliverance. Adi Shakti who vanquished demon Mookasura, was extolled by the gods as Mookambika. At Kola Maharshi’s prayer, the Divine Mother accompanied by all the Gods; stayed there to be perpetually worshiped by the devotees. 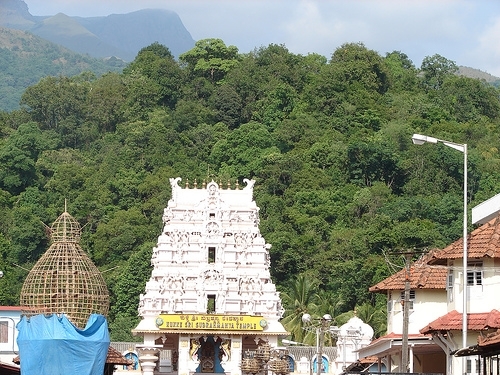 It is believed that Sri Adi Shankaracharya had a vision of Sri Mookambika Devi and he installed the deity here. The story goes like this. Adi Shankara mediated at Kudajadri hills and Devi was incarnated before him asking for his wish. He revealed his wish to incorporate devi to a place in Kerala to worship where he wanted. Devi agreed and put forward a challenge that she will follow Shankara and he should not look back until he reaches his destination. But to test Shankara deliberately paused and when he could’nt hear Devi’s anklets, Shankara suddenly turned. Devi then stopped following him and asked Shankara to install her vigraha as he has seen her. There are many inscriptions at Kodachadri that relate the tale of time. The Prakaras, which underwent renovation from time to time, hold a mirror to the changing mores in architecture during bygone cultures. Specifically the Vaasthu of Garbhagriha structure is very ancient and extraordinary. Among the temple architecture, the Balamuri Ganapathi idol that is made of white marble is beautiful and high of significance. Also there is an image of serpent which has formed on the stone in the south-west corner. It is believed that, as the devotees move in pradakshina, and touch this serpent and offer their pray. This entry was posted in Karnataka, Taxi, Temples and tagged Dharmasthala, Horanadu, hosanadu, kadri, Kaekala Gomata, kasargod, kateel, Kerala and Coorg, Kodachadri, kollur, krishna matt, krishna temple, Kudroli Gokarnanatha Temple, malpe, Moodabdri, Murudeshwara, Polali Temple, Sringeri, Subramanya, Temple Tours, udupi, Venur. Bookmark the permalink. how many dates is required for seeing udupi,dharmasthala,mookambi,subramanya and annapoora temples? Q. 2) How much taxi fare from mangalore railway station to udupi. Kindly send me the complete details to my mail id at the earliest. I would like to visit from magalore rly stn to mirudeeswar temple, moogambiagai temple, udipi, dharmasala and other nearest temples by car kindly give me the rates offered and the days required to travel to all theseplaces. I would like to visit hampi and jog waterfall. Is it possible within two days and how much it costs in a tempo traveller ? I want to visit from Mangalore Udipi, Sringeri, mrudeshwar, dharmastala, kateel, horanadu, subramanya kollur. Please let me know which is the best tour programme so that i can plan. how to go which to see first, etc. also let me know the rates tor car rent etc for this places. and the best possible period to visit. V r 2 members going to start frm Mangalore central railway station. V r planning to visit kukke, dharmastala on day1 by staying n8 at shringeri . Day2 to udupi and back to Mangalore by covering temples on the way. Our train is at 9 on second day. Kindly advice the package.